Five hundred years ago in India, Kalachandji, literally translated as "the beautiful moon-faced one," was worshipped as the Supreme Personality of Godhead by thousands of devotees. Impeccable craftsmen constructed an elaborate temple for Him; famous artisans decorated it. Accompanied by drums, cymbals and tambouras, His followers filled the halls with melodious prayers throughout the day, and the air was sweet with myriad varieties of richly fragrant incense. Daily He was offered sumptuously prepared foods of all descriptions made from grains, milk products and fresh vegetables. Everyone, from the King to the street sweeper, visited Kalachandji, paying respects and obeisances. No one could imagine passing the day without having His audience. From one generation to another the tradition continued, and then, suddenly, the Moguls invaded India. Fearing for Kalachandji's safety, His devotees hid Him from the plunderers, and thus the opulence and worship which He had formerly enjoyed all but came to an end. With grief in their hearts, His followers prayed for the day when His true position could be established again. Centuries later, the great devotee of Krishna, His Divine Grace A.C. Bhaktivedanta Swami Prabhupada, visited the sacred city of Jaipur, about 200 miles southwest of New Delhi. 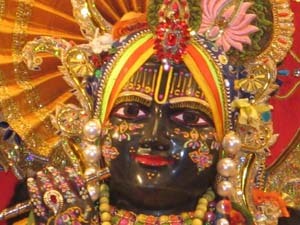 There, in a museum, he came upon a beautiful and ancient-looking Deity of Krishna being used to hold open a door. It was Kalachandji! With great devotion, Prabhupada beheld this wonderful form and begged the museum curator for permission to take the Deity and establish Him in His former, proper position. Thus Kalachandji was rediscovered after hundreds of years. Prabhupada arranged to have Kalachandji brought to America where he had a large temple building in Dallas. And so it was that "the beautiful moon-faced one" found a home in a new land. Immediately he began to attract many followers and, under Prabhupada's guidance, they revived all of the rituals of worship to the same level as hundreds of years earlier. Kalachandji's Restaurant and Palace are an attempt to offer what is best to the Supreme Personality of Godhead. Our visitors are invited enter into the mood of this centuries old tradition: the foods you will eat here are prepared from recipes found in the ancient Vedic literatures dating back 5,000 years and combine unique spicing and healthful, natural ingredients. The result is materially and spiritually uplifting. In keeping with ancient tradition, the price listed is a suggested donation.